Back in July I reviewed, all the way from a tiny holiday apartment on a blustery hill two miles from Lerwick, a thriller by SJ Bolton called Sacrifice, set in Shetland. I was vastly disappointed by it, not least because the Shetland of Sacrifice seemed to bear almost no relation to the Shetland I was visiting at the time, and I remarked that I was planning to read Ann Cleeves' Shetland Quartet instead (a television adaptation of which was being filmed on the islands while we were there). 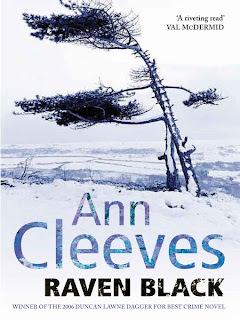 Yesterday, while hunched patiently on a hospital trolley waiting for an operation to remove a troublesome wisdom tooth, I finished Raven Black, the first book in the series, and thoroughly entertaining it was too. Raven Black is a thoughtful, atmospheric crime novel with a measured pace and solid, believable characters and a setting brought convincingly to life without sentimentality or lazy assumptions about Shetland life. When precocious teenager Catherine Ross is found murdered, the prime suspect is Magnus Tait, whom the islanders have long suspected of being involved in the death of another girl many years previously; his social and intellectual difficulties make him an easy target. However, Jimmy Perez, a detective from the tiny, isolated island of Fair Isle*, has reason to believe that Magnus may not be the culprit, and as the investigation unfolds, it becomes clear that in the small, tight-knit community of Shetland there are plenty of others who might have had a motive for killing Catherine. The story benefits from the author's decision to tell it not just from Perez' own point of view, but from the perspectives of several different characters, including Magnus Tait himself, schoolgirl Sally Henry and incomer Fran Hunter. Each character is well-rounded and credible, and each lends something different to the narrative. However, Perez himself is an engaging lead, trying to make decisions about his own future and his relationship with Shetland and Fair Isle as he attempts to unravel not only the mystery of Catherine Ross's murder but also the 'cold case' of Catriona Bruce, who, like Catherine, disappeared shortly after a visit to Magnus Tait's croft. Something that particularly interested me about Perez is that he seems to be the very opposite of the traditionally rational, driven, detached detective. He admits himself that he 'leaks unsuitable affection' with his 'almost overwhelming pity for Magnus Tait, whether he was a murderer or not' and his sudden urge to protect Fran Hunter, his former best friend's ex-wife, even though she could reasonably be a suspect too; his tiny, damp house was bought 'on a romantic whim'. Perez' quietly introspective nature and the bleak, chilly isolation of the Shetland setting, simultaneously lonely and claustrophobic for the novel's characters, gives Raven Black the feel of a Nordic crime novel as much as a British one. The final revelation of who killed Catherine Ross is at once startling and yet simultaneously completely believable: exactly what I look for at the end of a crime novel. I'll definitely be reading the other three books in the quartet.